How do I disable announcement replies for an entire course? By default, comment replies are disabled for announcements unless enabled in an individual assignment. 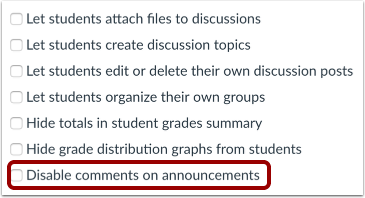 However, you can disable comments for announcements and have that setting applied to every announcement throughout the entire course. 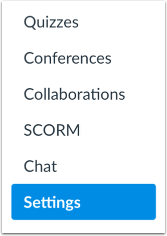 When this setting is applied, you cannot select the option to allow users to comment when creating an announcement. If you enable announcement replies, only newly created announcements will be able to allow user replies. Any existing announcements will remain locked and must be opened to comments individually in the Announcements page. Note: Depending on your institution's preference, comments may already be disabled in the course. Check the Disable comments on announcements checkbox. Note: If the checkbox is grayed out, comments have already been disabled by your institution and cannot be changed. Previous Topic:How do I hide grade distribution scoring details from students? Next Topic:How do I validate links in a course? Table of Contents > Settings > How do I disable announcement replies for an entire course?